A brand & product strategy to disrupt a century-old industry. Harry’s co-founders, Jeff Raider and Andy Katz-Mayfield approached Gin Lane in the early Fall of 2012 with a simple but powerful idea; to create a company that could offer a quality shave at a respectful price. I lead Gin Lane’s efforts across product strategy, interactive brand development, and copywriting for Harry’s digital experience at launch, then continued to work with the company on a series of strategic engagements across its first two years. I worked with Harry’s founders to write the story of their budding company; its purpose, its values, its place in the world, and its ambitions to change its industry. Together, we developed a frank but playful personality for the company, a voice that uses frank, simple language with the lightest touches of playful whimsy. Throughout the product development process, it became clear that Jeff and Andy were deeply focused on product excellence; from the enlightened chemistry behind its Shave Cream’s formula, the paintbrush-like quality of the razor’s flexible “neck,” and the deliberately significant weight of the handle’s body. To tell that story, I laid out a framework of three distinct story beats for each product; Origin, Feel, and Material. For each product, I wrote a small blurb of copy to focus on a unique point of interest. 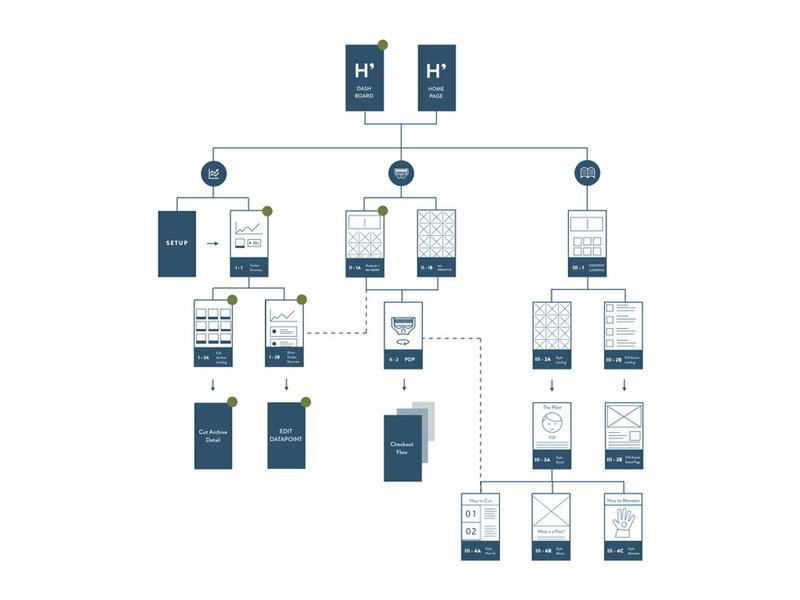 Working side-by-side with heavy-hitter-designer Gordon Sexton and Gin Lane’s creative team, we sculpted those stories into a holistic design system that would become the interactive signature for Harry’s brand. One of the most pressing challenges for the young digital-first retailer was to express the superior craftsmanship of its finished products through the glass-and-pixel barrier of the digital screen. To infuse the experience with a sense of tactility, we sketched, storyboarded and shot a series of interactive toys and tools to simulate the airy feeling of cream or a weighty razor handle in-hand. I continued to work with Harry’s across 2013 and 2014 across a variety of projects as its internal team grew. A personal favorite was the opportunity to continue to develop copy and content for the site, as well as advising on interaction mechanics for new features, like the “auto-refill” subscription services for blades and cream. Harry’s opened its first barbershop “The Corner Shop” in 2014. I worked with Gin Lane’s designers and Harry’s developers to concept and construct “The Cut Archive” - a lightweight CRM tool that captures the details of each cut to help barbers create a consistently superior experience. I also had the opportunity to weigh on the company’s first native mobile application, developing interactive concepts, feature needs, user flows, and technical requirements for a commerce-focused app.